Tickets for a day on the green’s concert with KYLIE MINOGUE at Bimbadgen, Hunter Valley NSW have now sold out. It was a similar story in Queensland with tickets selling out quickly at Sirromet Wines, Mount Cotton – a result that reinforces a day on the green’s position as one of Australia’s most popular outdoor concert events. The iconic pop princess will bring her Golden Tour to Australia, performing a string of headline shows at arenas and outdoor venues across the country next month, including playing a day on the green concerts for the very first time, in what is set to be one of the hottest tours of 2019. The Golden Tour marks Kylie’s first shows since 2015’s Kiss Me Once Tour and her very first time performing outdoor headline concerts in Australia. Cementing her reputation for a unique and captivating live show, each performance on the Golden Tour is a narrative connecting all of Kylie’s hits into one glorious story. Tracks from her ARIA number one album Golden, like Dancing and Stop Me From Falling, fit seamlessly in the tour setlist alongside Kylie’s endless pop classics, including Can’t Get You Out Of My Head, Spinning Around, The Loco-Motion and Love At First Sight. 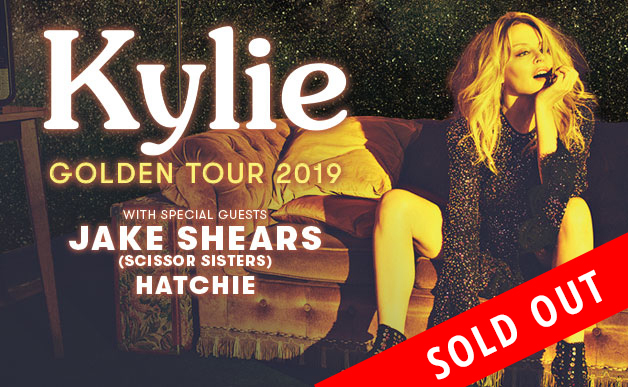 KYLIE will be joined by special guests JAKE SHEARS – of Scissor Sisters fame – and Australian singer-songwriter, HATCHIE. Australian indie pop outfit CLIENT LIAISON will also join the line-up in Perth. We cannot guarantee any ticket purchase made through any means other than the official ticketing agents listed on the A Day On The Green and Frontier websites.